The Bitnami Launchpad for Google Cloud Platform only supports server re-sizing during the server build. Since the server is accessible via the Google Compute Engine console, you can get a resized version of the server from there afterwards if needed. The procedure consists of creating a new server using the same disk as the server to be resized, and then deleting the old one following the steps below. 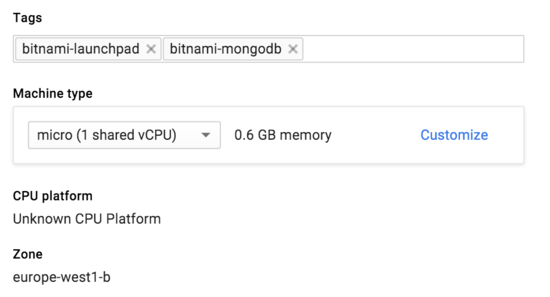 NOTE: For servers launched through the Bitnami Launchpad for Google Cloud Platform, select the cloud server you wish to modify in the Bitnami Launchpad and click the “Manage in the Google Console” button to access the Google management console. Log in to the Google Cloud Console using the Google Account associated with your project. Select your project from the list of available projects. Select the “Compute -> Compute Engine -> VM Instances” menu item. Select the instance you wish to resize. Stop the instance by clicking the “Stop” button. Once stopped, click the “Edit” button. Change the instance type and click the “Save” button at the bottom of the page. Click the “Start” button and wait for the instance to start again.